Typically springtime is when farmers, tug boat captains, the Corps of Engineers, and countless others whose livelihood depends on the Mississippi River anticipate high water. This year, however, the spring flood season was marked by minimal, if any, flooding. The Mid-South appeared to have made it through high-water season without a hitch. Unfortunately, the excess water was just late. As we move into early July, recent heavy rain in the Mid-Mississippi River Valley and the Ohio River Basin has resulted rising water levels downstream. As shown in the graphic below, rainfall over the past 30 days has been double normal amounts in those areas, which all drain south into the river that flows past Memphis. Accumulated precipitation for the past 30 days shows nearly double the normal precipitation upstream from the Mid-South. As far as local precipitation, the past 30 days has featured accumulated precipitation that is above normal, however there is a major caveat in that data. Nearly 2" of rain fell right at the beginning on that 30-day window (May 31) and the amount above normal has decreased pretty much ever since. In fact, for the month of June to date, the total precipitation at Memphis International Airport is under 2.5", which is well below normal. Thus, the river can continue to rise towards flood levels even with below average precipitation for a 4-week period locally. 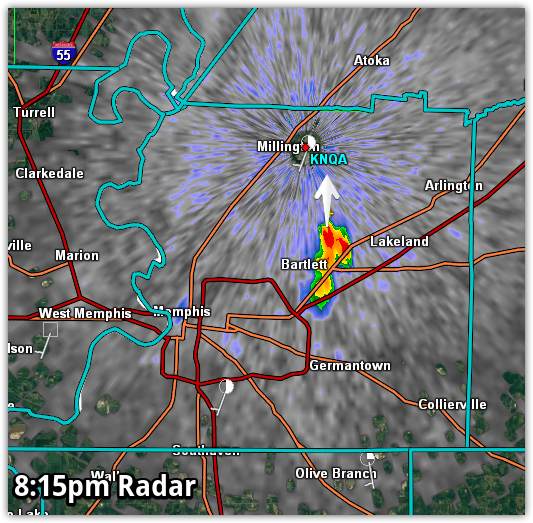 Rain that falls locally, while having a significant bearing on the levels of tributaries and streams that flow into the Mississippi River, actually have little to no effect on the main channel itself here in Memphis. The graphic below shows the current Flood Warnings (lime green with green outline) and Flood Advisories (green with no outline) in effect along the Mississippi River in the Mid-South. Flood Warnings are issued with flood stage is expected to be exceeded, while an advisory is issued when the river level will result in some impacts locally, but flood stage is not expected to be exceeded. 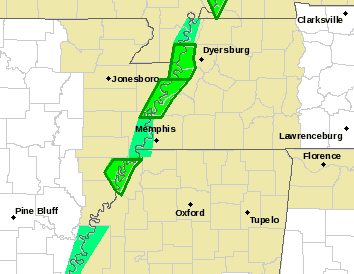 Flood Warnings (outlined) and Advisories (no outlines) line the Mississippi River throughout the Mid-South. An article in this morning's edition of the Commercial Appeal details the impacts to local farmers, particularly those outside the levees in east Arkansas, of the late flood. In particular, thousands of acres of maturing soybeans are flooding with little chance of being salvaged this season. In addition, by the time the river recedes and fields dry, it will likely be too late to re-plant and get a full season of growth in before harvest time. Typically, these crops are planted after the "usual" spring flood season is over. 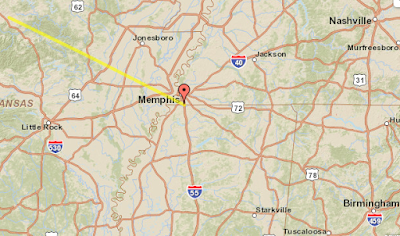 Flood stage for the Mississippi River at Memphis is 34.0 feet. This morning's stage was 28.5 feet and the river is expected to crest at 30.5 feet on Wednesday, July 8. Obviously, it doesn't take a stage of 34 feet to begin having an impact on local agricultural, and other, interests. 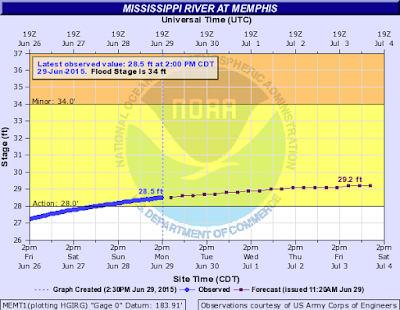 Today's Mississippi River stage and this week's forecast at Memphis is shown in the hydrograph above. Just upstream, the river level at Osceola, AR, which also affects Tipton County, was 28.8 feet. Flood stage is 28.0 feet, thus the river is in flood at that location. It is expected to reach 30.5 feet by next Tuesday with possible additional rises thereafter. South of Memphis, the water level at Tunica is also expected to rise above the flood stage of 41.0 feet early next week. The river levels can be monitored anytime via the Mississippi River Forecast page on MWN. Unfortunately for those who are hoping for a quick decrease in river levels, forecast precipitation in the Ohio/Tennessee River basins and Mid-Mississippi Valley shows a lot more water could be headed into the river here in the Mid-South (graphic below). Forecast precipitation for the coming 7 days would indicate the likelihood of water levels remaining high on the river for the forseeable future. An unseasonably strong cold front dove through the Mid-South early Saturday morning, bringing with it drier and cooler air just in time for the weekend. With highs in the 80s and dewpoints in the low to mid 60s, the sunshine has resulted in pleasant days, rather than nature's sauna. Surface high pressure that is overhead this weekend will shift east though, meaning we're back in southerly flow by Monday and humidity levels will begin to increase. Sunday mid-day surface analysis shows our recent cold front down near the Gulf coast while high pressure dominates the eastern U.S., bringing pleasant conditions. Well above the surface, the eastern U.S. is dominated by a large trough of low pressure, which means the potential for unsettled weather. That pattern includes the Mid-South as cold fronts move by to our north, with the potential for thunderstorm complexes generated by these fronts diving south. These complexes are called MCS's (mesoscale convective systems) and we've talked about them before. They can be unpredictable both in the long term and the short term and they can bring damaging wind and torrential rain, as well as a lot of lightning. 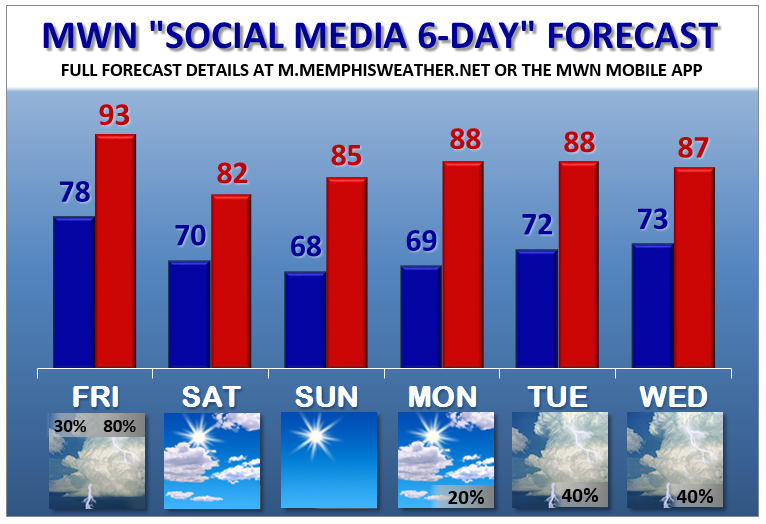 In the Mid-South, they are most common in "northwest flow," which means the wind at the mid levels that drives storm complexes is blowing from the northwest, and that's the pattern we'll be in to some degree most of this week and right into next weekend. The pattern at the mid levels this week will be dominated by northwest flow over the Mississippi Valley, as shown in this 500mb (18,000') forecast for Wednesday evening from the GFS model. A huge dome of high pressure over the western U.S. and general trough of low pressure over the eastern U.S. results in northwest wind over the Mid-South, which is a conducing pattern to unsettled weather and potential MCS activity from the Mid-South into the Ohio Valley. As far as the forecast is concerned, though there is a very slight chance of a thunderstorm tomorrow, chances increase a bit Tuesday, then scattered thunderstorms are in the forecast for the remainder of the week. 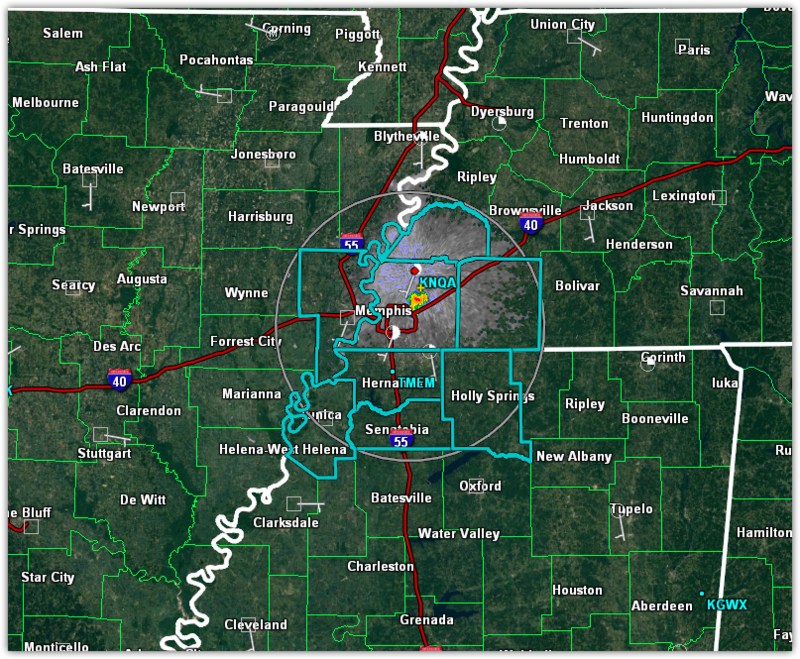 However, the main factor in our daily rain chances will be any MCS's that form and move into the area. Rain chances will be likely when one moves through, then probably dry for the rest of the day or night behind one as the atmosphere "re-energizes." Panel discussion, July 1, 7:00pm: "The NWS - in 2015 and Beyond"
In recent weeks, a bill was introduced in a subcommittee of Congress ("The National Weather Service Improvement Act" - click to read) that would consolidate the forecasting operations for the United States from the current model of 122 "local" forecast offices to 6 "regional hubs." Within the meteorological community (and not just at the NWS level), the outcry was immediate, including the NWS Employee's Organization, the broadcast community, and many others. Also outside the weather world, such as the emergency management spectrum (specifically the International Association of Emergency Managers), the pushback was also loud and clear. The chief complaints were that removing the forecasters from their local areas of responsibility would reduce forecast accuracy due to knowledge about local effects within an area being dispersed; that the local "touch" would be lost in areas such as collaboration with emergency management and response, local education outreach, and general relationship-building that takes place at the local level; and of course, the expected residual impact of the loss of hundreds or perhaps thousands of good meteorology jobs currently filled by experienced forecasters. On the supporter's side, consolidation meant more collaboration between forecasters that are currently subdivided into their smaller areas of responsibility and more efficient (and thus lower cost) operations. In fact, the response was strong enough that within just a few days the bill was stated to be amended to remove the consolidation in favor of a mandate that the NWS assess its severe weather watch and warning system to ensure that the public responds effectively to severe weather threats. 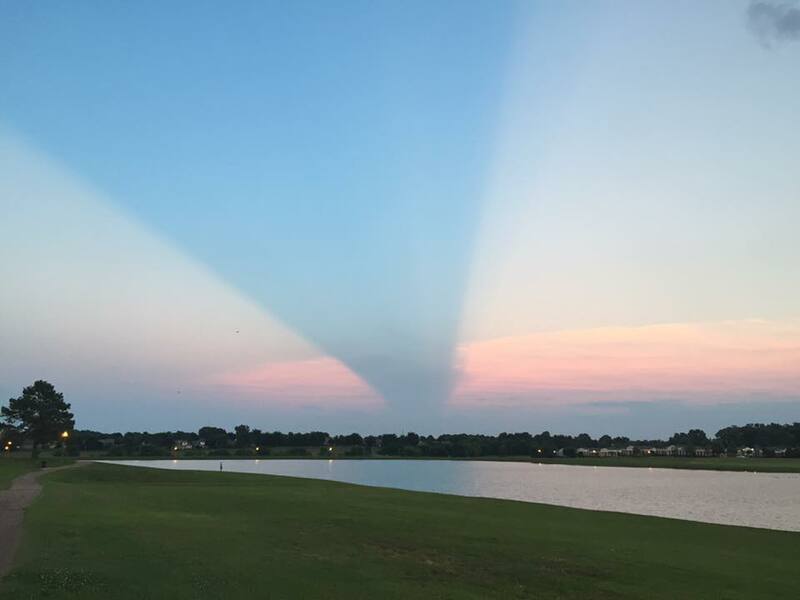 Within five years of bill passage, the NWS, after careful evaluation and survey of users, would be required to have a new system of alerting the public in place. 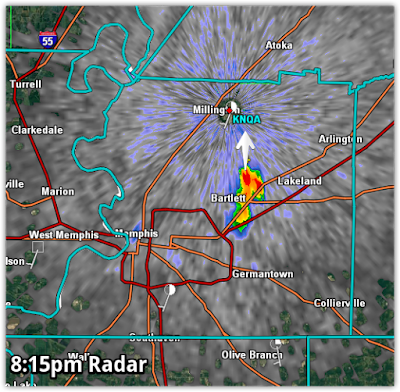 On Wednesday night, July 1, at 7:00pm, MemphisWeather.net will host a panel discussion via Google Hangout on the implications of the recent Congressional action, the role and responsibilities of the NWS today, what they should look like in the future to most capably serve the public, and how the broadcast and private sectors can best partner with the NWS to assist in fulfilling their mission to protect life and property. Included in the discussion will be a conversation around the current watch/warning system and what changes might be proposed that would raise the level of awareness, and response, by the public to severe weather (convective, winter, tropical, and so on). Panelists are being finalized but are expected to include NWS-Norman (OKC) Warning Coordination Meteorologist Rick Smith, WREG-TV broadcast meteorologist Austen Onek, Mississippi State University Meteorology graduate student and future NWS meteorologist William Churchill (representing the future of the NWS), and weather enthusiast and frequent MWN Hangout guest John Maddox (representing the general public voice). MWN meteorologist Erik Proseus will host the discussion. We hope you will join us on Wednesday night for a great discussion on "The National Weather Service - In 2015 and Beyond." There will be an opportunity for you to ask questions as well, including on the MWN Hangout page linked below, as well as on the Google+ event page . Watch our social media channels for details on how you can participate! Who's ready for cooler weather?? Wish granted! A very hot week featuring Heat Advisories and heat index values of 105-110° is coming to an end with one more hot day tomorrow (but not quite as bad as the rest of the week). 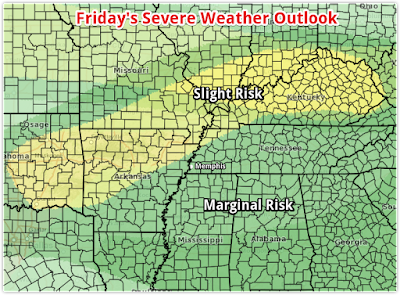 The reason for slightly lower temperatures Friday will be more cloud cover and a few thunderstorms in the afternoon. Humidity levels will remain high, so heat indices will be in the lower 100s. By tomorrow night, an unusual cold front (for summertime) will push into - and through - the Mid-South. This front will bring a high chance of thunderstorms with most in the Mid-South seeing a half inch to one inch of rain overnight. There is also a small chance that severe weather could occur, mainly in the form of damaging wind and, secondarily, large hail. The metro is currently in a Marginal Risk (category 1 of 5) zone, while areas just to our north are in a Slight Risk (2 of 5). Most of the storms and rainfall will occur after dark Friday night, but if you have outdoor plans during the evening, you'll want to keep a close eye on StormView Radar and our Twitter feed via the MWN mobile app as storms could affect your plans. By Saturday morning, rain should be over and, though it will be a warm start to the day with lows in the low 70s, much cooler and drier air will filter in throughout the day on a dare-I-say "refreshing" north breeze. As clouds move out, look for temperatures to peak about 10 degrees cooler than Friday, in the lower 80s. In addition, dewpoints (a measure of atmospheric humidity) will fall into the low 60s, making for a very pleasant afternoon and evening. Very unusual for late June - a cold front diving all the way to the Gulf Coast as shown by the NOAA Surface Analysis forecast for Sunday morning. Sunday will feature more pleasant weather with low humidity, sunny skies, and highs once again in the 80s. A slight warming trend takes place next week, but with rain chances increasing once again, looks for highs to remain primarily in the 80s with lows in the lower 70s. 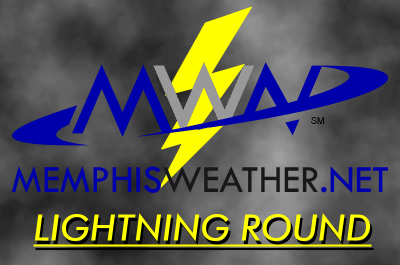 It's once again time for the MWN Lightning Round, in which we hit a few different topics in rapid succession and let you get on about your day, armed with insightful new information! A hot day was once again tempered just a bit by thunderstorm-induced cloud cover today, although high humidity values still pushed the heat index over the century mark this afternoon. With a large upper-level ridge continuing to expand the next two days, fewer storms are expected, thus we expect highs to reach their full potential in the mid to upper 90s. Combined with dewpoints in the 70s, we'll see heat index values near or exceed the danger level of 105° Tuesday and Wednesday. 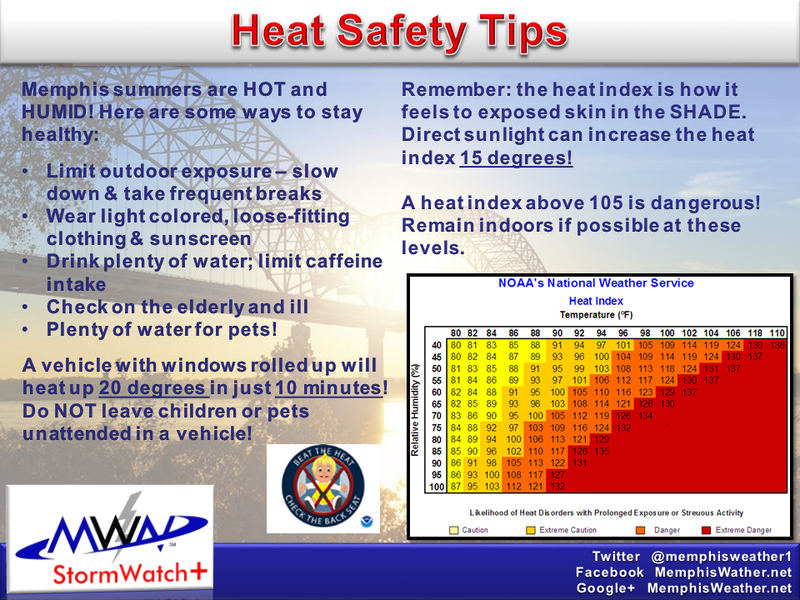 Practice the heat safety tips below and check out our complete guide to staying safe on a Memphis summer day! Remember also that successive hot days have a cumulative effect and heat illness can occur more quickly in the same heat when there is less opportunity to recover from previous days. Overnight lows in the upper 70s can provide little relief. 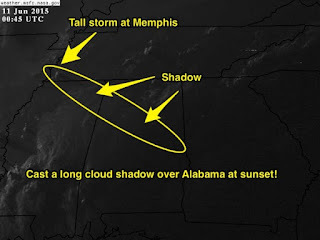 If our previous article on a lone thunderstorm casting a shadow into Alabama wasn't enough to convince you, we have another example of how weather hundreds (or thousands!) of miles away can affect an area. You may have noticed on your way home from work today that the sun seemed filtered and the sky hazy when looking off in the distance. 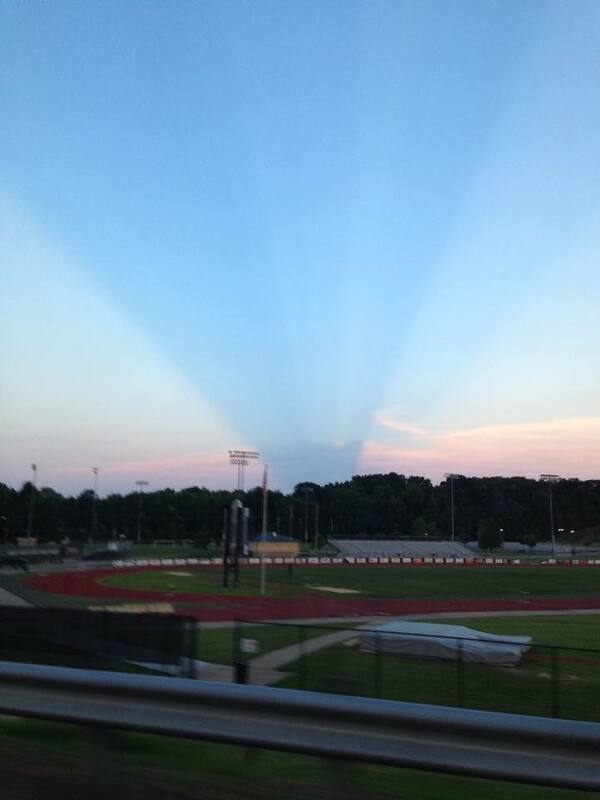 Although there was a veil of high cirrus clouds from earlier thunderstorms, there also was a noticeable haze. It wasn't just summertime urban air pollution you were seeing. 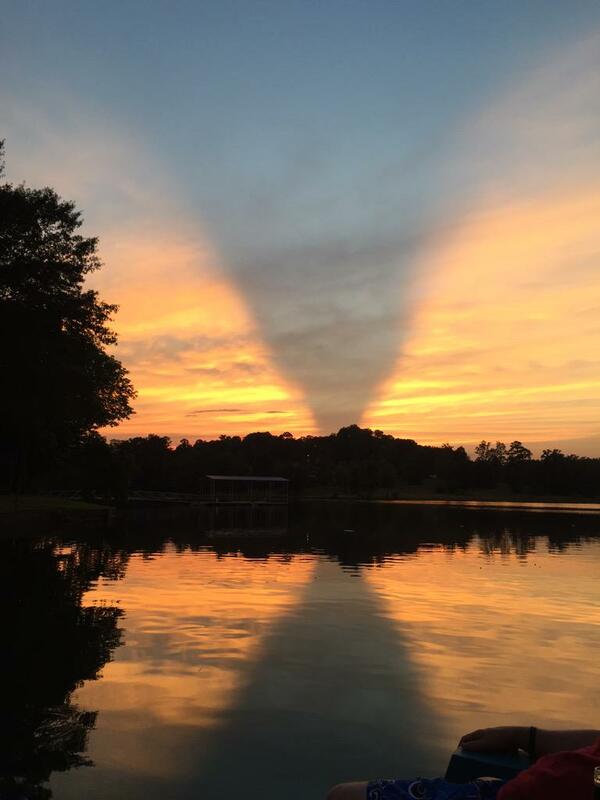 In fact, it was a thin veil of dust from the Saharan desert! 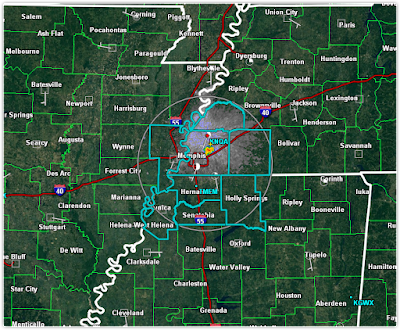 A combination of local emission sources and transported Saharan dust are creating very hazy skies as the particles are easily remaining suspended in the very humid conditions over the Mid-South. We've written one other time about dust that actually accumulated on vehicles and outdoor objects - that was April 2014 from dust storms in the Central Plains. This dust has a much more exotic origin and won't be enough to create a coating, but is reducing visibility just a bit. 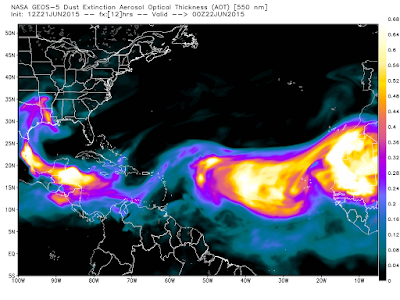 The image below shows the concentration of Saharan dust over the Atlantic Ocean and into Central America and the southern U.S.
Saharan dust thickness at 7pm Monday is shown in this model graphic from WxBell Analytics. Another long-distance connection - this one farther than the Sahara to the Mid-South - is occurring today as well. A geomagnetic storm on the sun hurled multiple coronal mass ejections (CMEs) at the Earth over the past couple of days. Today, the strongest of these reached our magnetic field and prompted space weather warnings indicating a blackout of low-frequency radio waves over North America. The "Planetary K-Index" is a scale used to measure the strength of these waves, which are then tied to expected impacts. The index spiked this afternoon at a magnitude 8. This is strong enough to have some effect on power grids, radio waves, and communication with aircraft, as well as on orbiting spacecraft. The Planetary K-Index spiked at a level 8 this afternoon as a strong CME bounced off the earth's magnetic field. In addition, strong CMEs tend to produce more vivid aurora borealis, which can be seen further south from the poles as they get stronger. Some northern U.S. locations could have a decent chance of seeing the aurora tonight if skies are clear. While there is some chance of aurora dipping farther south, it is highly unlikely we'll see the northern lights in the Mid-South. 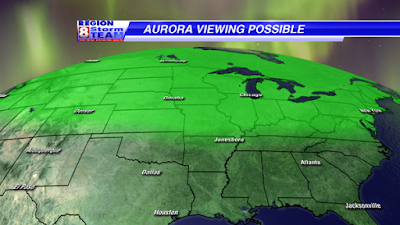 An aurora map produced by KATV meteorologist Ryan Vaughan (@ryanvaughan on Twitter) indicates a low probability of aurora viewing into the central U.S.
More really cool graphics, animations, and information can be found on the Space Weather Prediction Center's homepage. Will Bill ruin weekend plans? And how hot will it get next week? 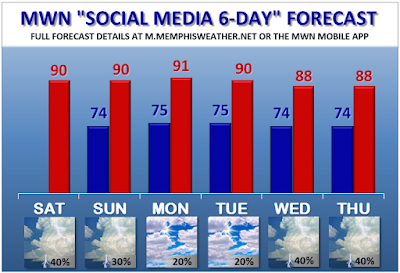 MWN meteorologist Erik Proseus discusses the effects Tropical Depression Bill will have on your weekend forecast, as well as a huge dome of high pressure that turns up the heat on the Mid-South next week, in today's MWN Video Forecast Discussion. 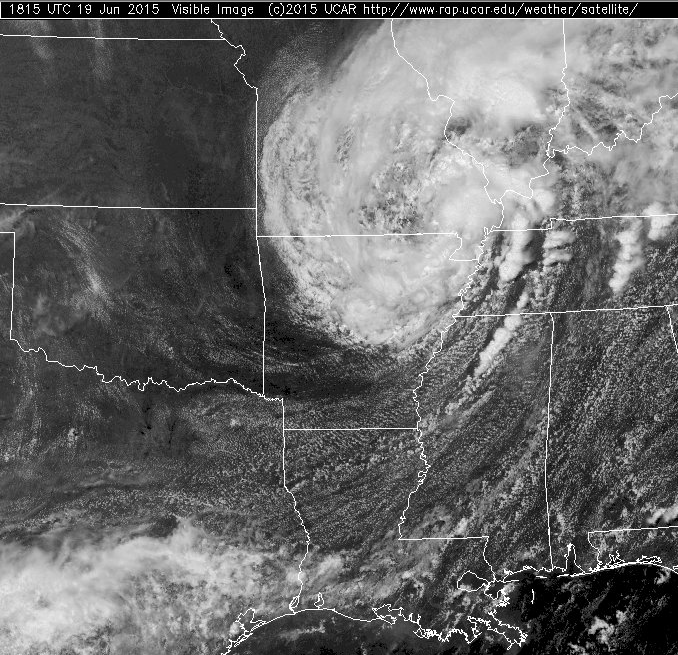 Tropical Depression Bill spins over northern parts of the Mid-South in afternoon visible satellite imagery. 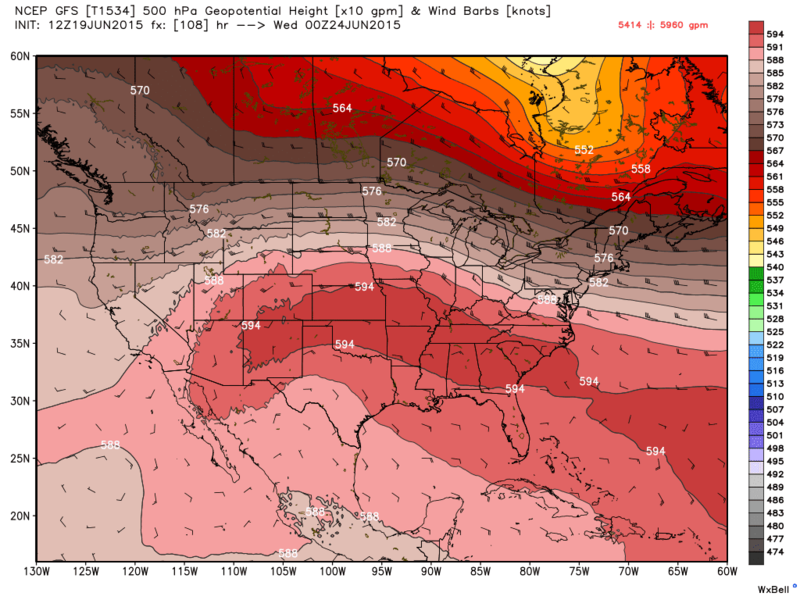 A massive dome of hot high pressure encompasses the entire southern U.S. Tuesday afternoon as depicted by the GFS model. Graphic courtesy WxBell Analytics. Be sure to check out our heat safety tips and plan to put them into practice as we head into next week and summer OFFICIALLY begins! 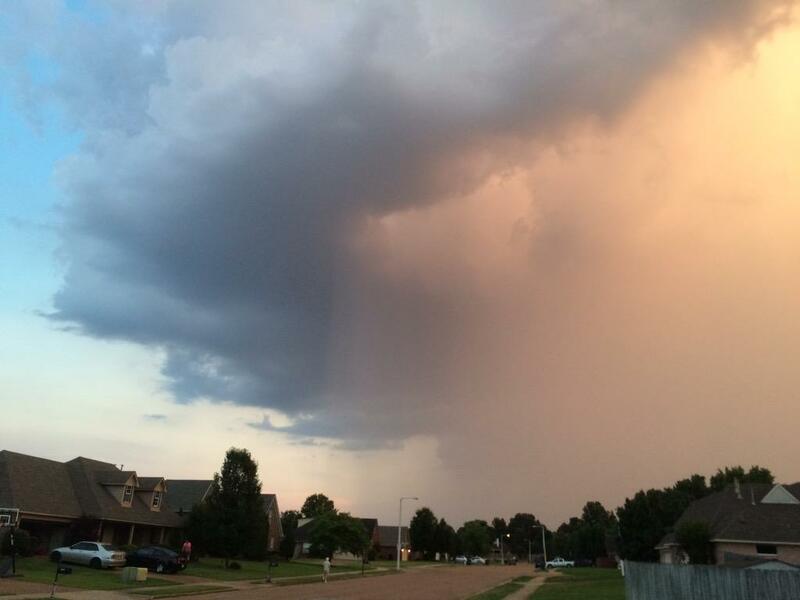 Bill makes landfall - how will it affect Mid-South weather this week? Shortly before noon, Tropical Storm Bill made landfall on the Texas coast at Matagorda Island. 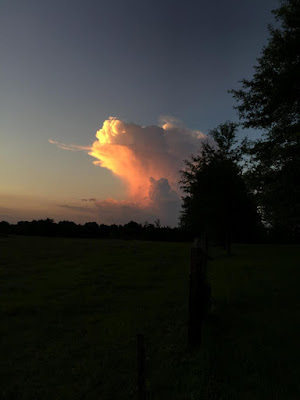 This was the second tropical storm of the 2015 Atlantic hurricane season and the second land-falling system, following Ana which struck the U.S. near the North/South Carolina border in mid-May. Maximum wind in Bill was around 60 mph at landfall, but the bigger threat with this tropical low is copious amounts of precipitation and resultant flooding that is expected in eastern TX and perhaps into far eastern OK and western AR. Rainfall totals of 4-8" will be common, with locally higher amounts, along the path of the low as it moves north. 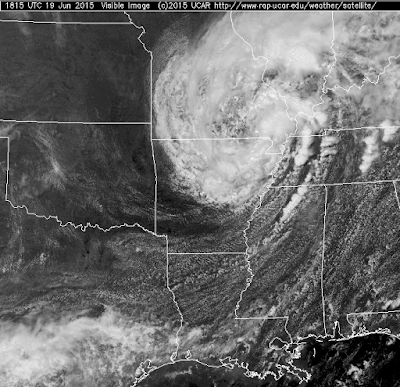 Visible satellite loop during the day Tuesday as Bill makes landfall on the middle TX coast. Precipitation forecast through Friday morning as Bill moves north, then turns east towards the Ohio Valley by Friday. 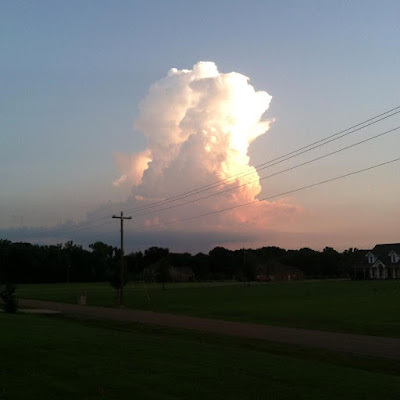 So where does Bill go now and what effect does it have on Mid-South weather? The track from the National Hurricane Center take the storm just east of Austin and over Fort Worth on Wednesday, then southeast of Oklahoma City and over the Ozarks on Thursday. By Friday, the remnant low moves across southern MO and then over southern IL on Friday night. Forecast track for Bill as of 1pm Tuesday. This forecast track is the result of a broad area of high pressure over the southeastern U.S., around which the low will track. The Mid-South remains under the influence of this hot high pressure system, and thus will receive only indirect impacts from Bill. 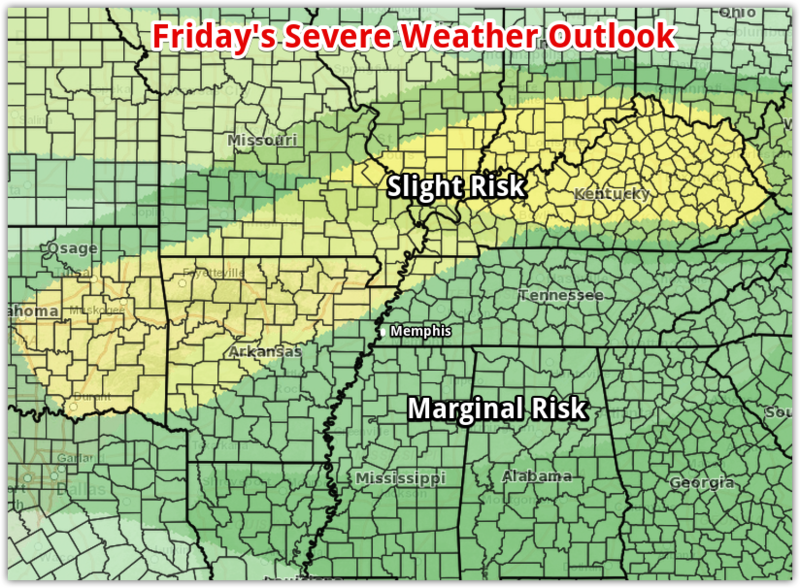 The most likely time for Bill's impacts in the metro is Friday. As it passes through southern MO on Friday, showers and thunderstorms will be possible across the area, including the metro. In addition, wind will pick up with some gusts to 20-30 mph possible, especially in AR. A few storms could be strong with high wind being the main threat. There will also be a potential for flash flooding, though that hazard will mainly impact areas closer to the center of the low, north of the metro. Heavy downpours will be possible locally as well, due to the amount of moisture in place ahead of the system and the tropical moisture escorted into the area by the low. In the meantime, plan for only widely scattered showers or thunderstorms and a lot of heat! 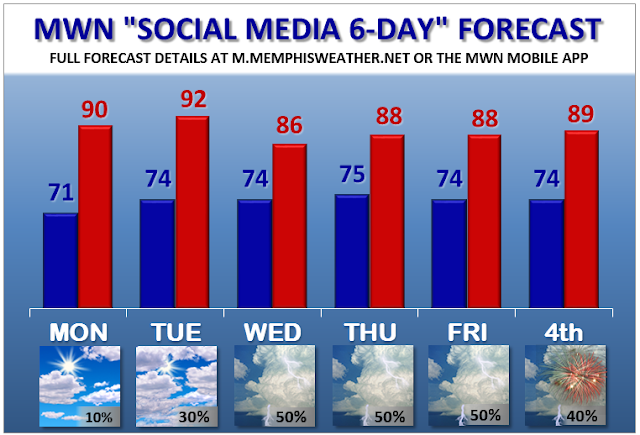 Temperatures will be into the 90s the next couple of days with heat indices near 100. See our heat safety tips below that are worth reviewing, and practicing, during these hot June days. Unfortunately, it appears the heat will continue through the weekend and well into next week. Stay cool! 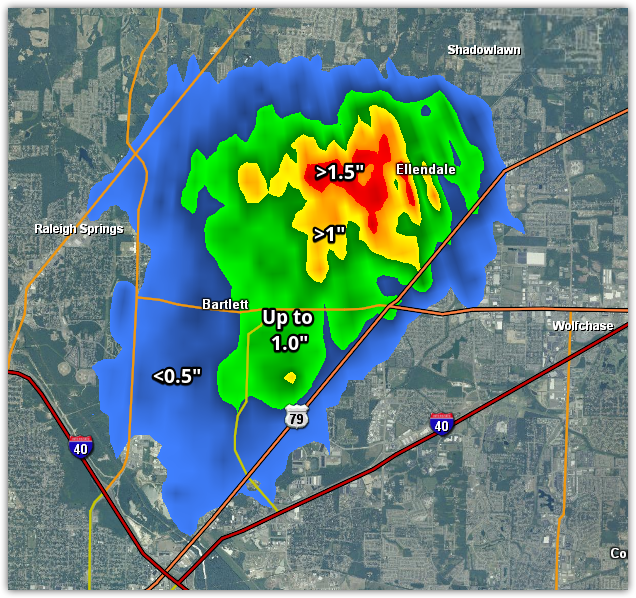 It was the only storm for over 125 miles (I guess a 10% rain chance was about right!). Since it didn't budge, despite seemingly showing a slow northward drift initially, rainfall rates were impressive, owing to the high moisture content of the atmosphere with dewpoints near 70. 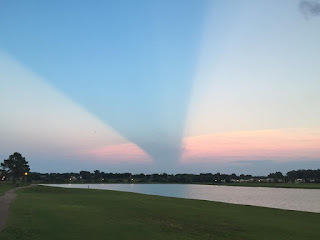 Though it lasted only about an hour, the cool part of this storm was not what happened under it, but what people saw from a distance, since it was isolated in nature. He put a few pictures, including the one above, in a blog and included the graphic below. Though a bit difficult to make out due to low contrast, it shows the path the shadow would cast at sunset based on the angle of the sun, overlaid on a satellite image showing the storm cloud over Bartlett. 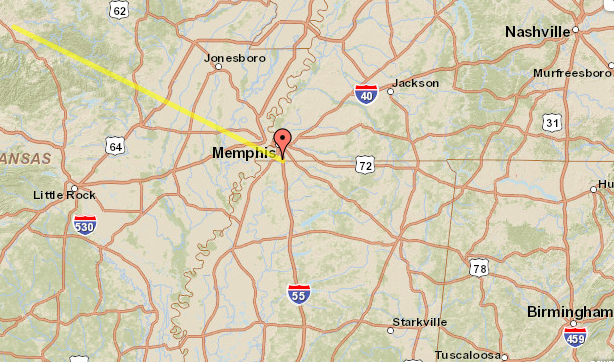 I put the coordinates in a solar calculator to verify the sun angle James came up with and, sure enough, because of the low sun angle (shown in yellow on the map below), the isolated nature of the storm, and it's height, a shadow was cast about 200 miles "downstream!" Cool conditions during the latter half of April transitioned to above normal temperatures in May for most of the month with the exception of a couple of very cool days on the 21st and 22nd. In addition, a dry April turned into a wet May with precipitation above normal across the Mid-South. Memphis International Airport still has a year-to-date rainfall deficit of 4.06", or about 83% of normal. Through May 31, the year-to-date average temperature is 1.5 degrees below normal, primarily due to a very cold start to the year that has yet to be overcome with slightly above average temperatures since then. There were a few rounds of thunderstorms in the metro, but severe weather continued to be below the typical spring pace, especially considering May is typically peak severe weather season in the Mid-South. Minor wind damage reports were received on the 24th and 29th in the metro. 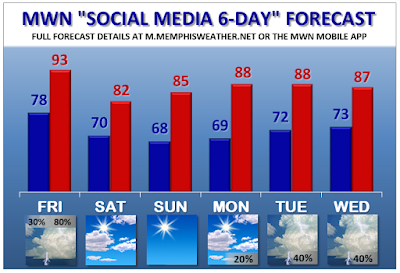 For the three-month period defined as "meteorological spring" (March-May), Memphis International Airport had an average temperature of 63.6 degrees (0.7 degrees above normal), 14.57" of precipitation (1.34" below normal), and 3.6" of snow (3.2" above normal), all of which fell in the March 5th-6th storm system. Records set or tied: The high on May 21 of 64 degrees was the coolest May 21 on record, but 8 degrees off the record. The low of 48 the following morning tied for 2nd coolest low temperature for May 22, but was 7 degrees off the record. Comments: No days reached 90 degrees this month, which is 2 below an average May. High temperatures averaged near normal, but low temperatures averaged nearly 2 degrees above normal due to abundant cloud cover for large parts of the month, resulting in a daily average that was slightly above normal. Comments: Nearly half of the days of the month received measurable precipitation, resulting in above average rainfall. However, nearly 2" of rain on the 31st resulted in a drier than normal month ending wetter than normal. 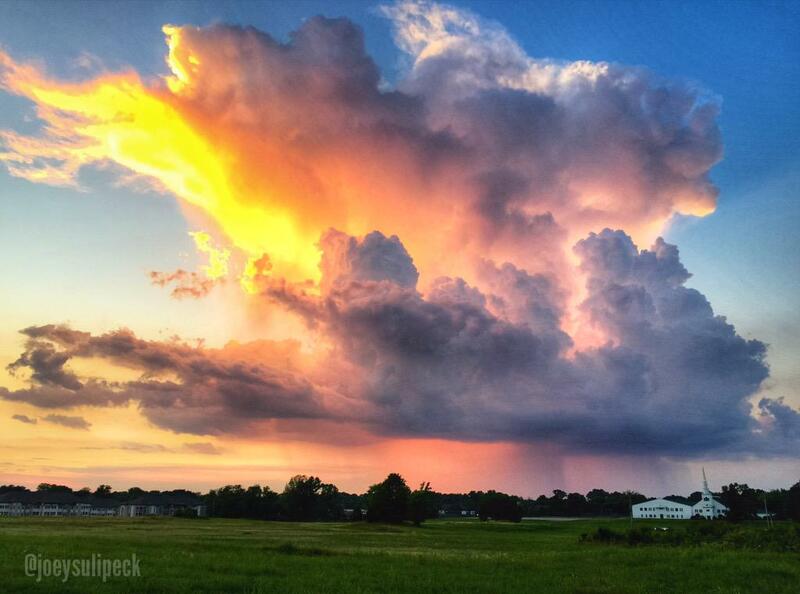 Three days recorded more than 1" of rainfall for the month. Many Memphians are aware of, or experienced, the record-breaking heat of the summer of 1980, even though it was 35 years ago this summer. 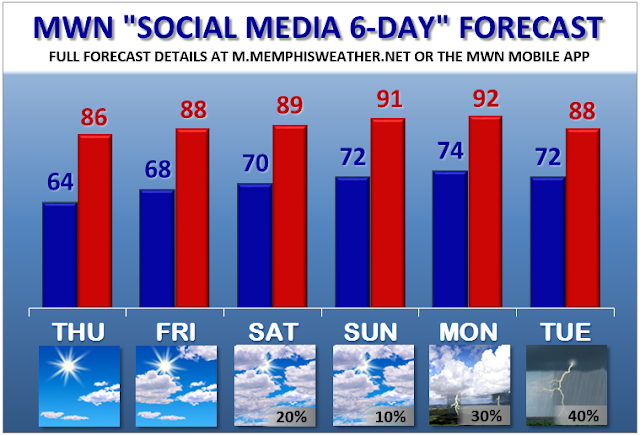 The longest streak of 90-degree temperatures in Memphis recorded history was July 25-September 16, 1980 (54 days). Just prior to that, the longest recorded streak of 100-degree days occurred, a 15-day stretch from July 6-20, 1980, including the all-time record high of 108°F set on July 13, 1980. 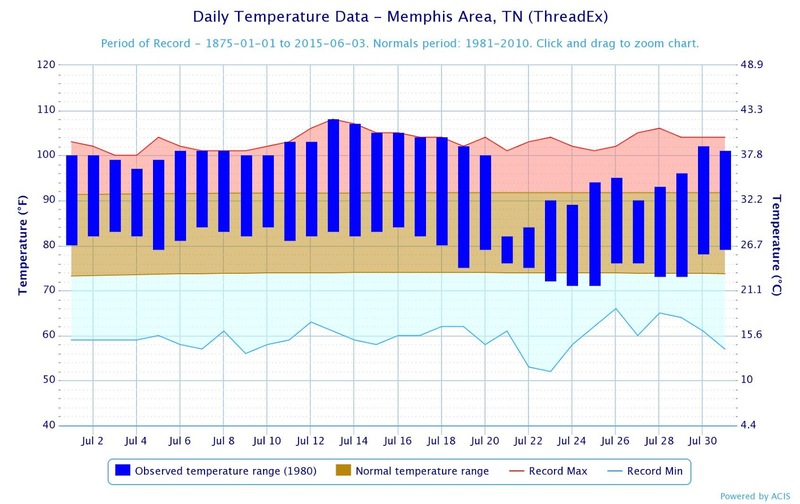 Eight July days still have high temperature records set that year and 12 July days have maximum low temperature records, all of them at or above 82°F (Source: http://www.memphisweather.net/alltime-shtml). A graph of observed temps (blue bars) for July 1980 in Memphis shows just how hot it was that month. Many days set record highs (red line) with temperatures above 100° and low temperatures frequently above 80°. The hot weather of July 1980 resulted in 83 deaths in Memphis and at least 1,700 nationwide during that summer. This heat wave tragically demonstrated that heat and humidity can be a deadly combination. These factors put a lot of stress on the human body and can lead to serious health conditions such as heat exhaustion, heat stroke, or even death. The more extreme the temperature, the shorter the amount of exposure time needed to fall ill.
Heat waves have the potential to cover a large area, exposing a high number of people to a hazardous combination of heat and humidity. In fact, heat is typically the leading cause of weather related fatalities each year, averaging 123 deaths per year from 2004-2013 and even more heat-related illnesses. From 1998-2014, an average of 37 children nationwide have died each year from heat stroke in a vehicle. High temperatures and humidity, and thus heat-related illness, are common in the Mid-South. The Heat Index is a measure of how hot it really feels when relative humidity is factored in with the actual air temperature. 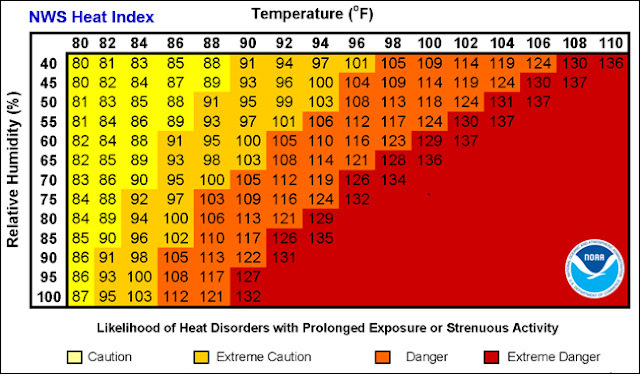 To find the Heat Index temperature, look at the Heat Index Chart below or check this Heat Index Calculator. As an example, if the air temperature is 96°F and the relative humidity is 50%, the heat index - how hot it feels - is 108°F. The red area without numbers indicates extreme danger. 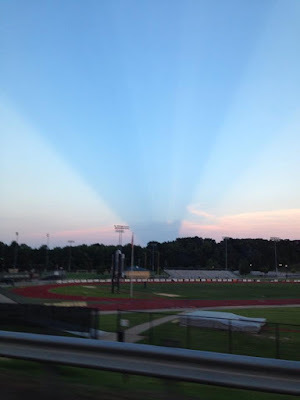 The National Weather Service in Memphis issues a Heat Advisory when the Heat Index is expected to peak between 105°F-109°F. An Excessive Heat Watch is issued when, 24-72 hours in the future, the Heat Index is expected to exceed 110°F and overnight low temperatures will be above 75°F. An Excessive Heat Warning is issued when the Watch criteria above are occurring or imminent (within 24 hours). Since heat index values were devised for shady, light wind conditions, exposure to full sunshine can increase heat index values by up to 15°F. Slow down! Reduce, eliminate or reschedule strenuous activities until the coolest time of the day. Children, seniors and anyone with health problems should stay in the coolest available place, not necessarily indoors. Dress for summer. 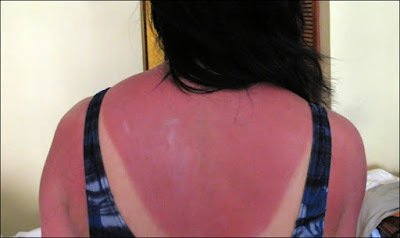 Wear lightweight, loose lifting, light-colored clothing to reflect heat and sunlight. Keep your children, disabled adults, and pets safe during tumultuous heat waves. Make sure outdoor pets have a shaded place to stay and that they have plenty of fresh water. Always lock car doors and trunks - even at home - and keep keys out of children's reach. Always make sure children have left the car when you reach your destination. Don't leave sleeping infants in the car ever! Graph courtesy NoHeatStroke.org showing how fast an enclosed vehicle heats up. Even on mild days in the 70s, studies have shown that the temperature inside a parked vehicle can rapidly rise to a dangerous level for children, pets and even adults. Leaving the windows slightly open does not significantly decrease the heating rate. The effects are more severe on children because their bodies warm at a rate 3-5 times faster than adults. 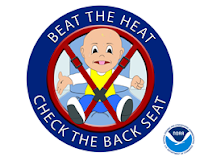 A dark dashboard or carseat can quickly reach temperatures in the range of 180°F to over 200°F. These objects heat the adjacent air by conduction and convection and also give off long wave radiation, which then heats the air trapped inside a vehicle. For more information on preventing children's deaths due to heat stroke, visit NoHeatStroke.org or download this fact sheet (PDF). The following information is courtesy of the Centers for Disease Control and Prevention. Heat cramps may be the first sign of heat-related illness, and may lead to heat exhaustion or stroke. Symptoms include painful muscle cramps and spasms, usually in the legs and abdomen, and heavy sweating. To treat cramps, apply firm pressure on cramping muscles or gently massage them to relieve spasm. Take sips of water unless nausea occurs, then stop drinking. If a person experiences any of the following symptoms, heat exhaustion may have set in: heavy sweating; weakness; cool, pale, clammy skin; fast, weak pulse; possible muscle cramps; dizziness; nausea or vomiting; or fainting. Treatment includes laying the person down in a cooler environment, loosening clothing, applying cool, wet cloths to as much of the body as possible, fanning the body, and sips of water. If the person vomits more than once, seek immediate medical attention. Heat stroke is the worst type of heat illness and is sometimes marked by an altered mental state. One or more of the following symptons is present: throbbing headache, confusion, nausea, dizziness, shallow breathing. Also the body temperature rises above 103°F, skin becomes hot, red, dry or moist, a rapid and strong pulse is felt, and the person faints or loses consciousness. Heat stroke is a severe medical emergency. Call 911 or get the victim to a hospital immediately. Delay can be fatal. Do not give fluids, otherwise treat the person as you would for heat exhaustion until medical assistance arrives. 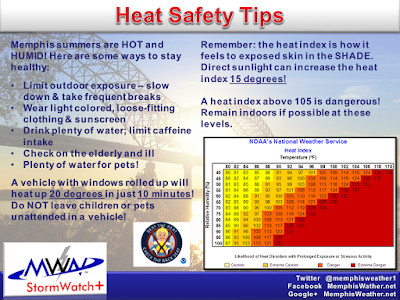 For more information on heat safety, check out this detailed heat awareness webpage from the National Weather Service. Most of the information contained in this article was originally published by NOAA/National Weather Service and NoHeatStroke.org. MemphisWeather.net is a NOAA Weather-Ready Nation Ambassador and we use their published material to help improve the nation’s readiness, responsiveness, and overall resilience against extreme weather, water, and climate events. The past few days have been a nice cool (and finally drier) start to meteorological summer, which began June 1. I personally enjoyed the 70s a great deal. However, if you've been waiting on REAL summer - some heat and humidity - we've got great news! 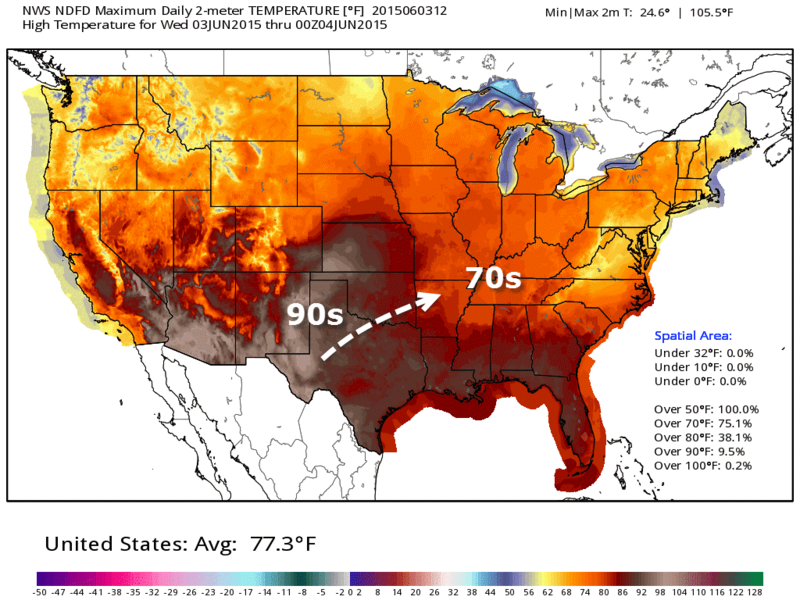 Signs of summer have been appearing in the southern Plains the past couple of days (temps into the low 90s) as an upper-level ridge has established itself over that part of the country. That ridge will build east towards the Mid-South, bringing warmer weather with it. High temps today (Tuesday) were pleasant into our neck of the woods, but show signs of warming to the west. Graphic courtesy WeatherBell Analytics. However, we'll be on the eastern edge of the ridge, which means we won't get the full brunt of it, and in fact, it'll put the area in "northwest flow" as we head into the weekend. 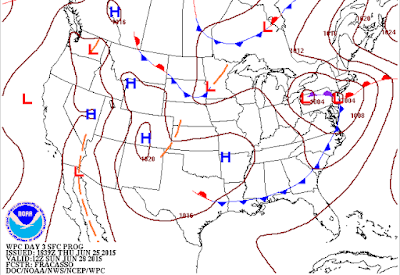 The upper level pattern on Saturday features northwest flow as a ridge of high pressure to our southwest builds east into the region, increasing temperatures. As storms form in the Plains, this northwest flow pattern creates a track for those storms that moves them towards the region from the northwest. While we can't time any potential thunderstorm complexes this far out, our rain chances increase slightly this weekend. With heat and humidity building as well, it will make for a summer-like pattern over the region. As we head into early next week, the upper level ridging gets flattened out like a pancake into more of a "zonal flow" (west to east with no big ridges or valleys), which will allow a cold front to move into the area from the north, further increasing rain chances and dropping temps just a bit. The upper level pattern by next Tuesday becomes more "zonal" allowing a surface front to move into the region and increasing rain chances. Stay cool, stay hydrated, and use the sunscreen!